There were many positives in Windies’ tie with India in the 2nd ODI, so many positives that, maybe they should have won. It was a colossal opportunity to draw level in the five match ODI series, even more so in hindsight, as the Indians recalled the number one ranked Jasprit Bumrah along Bhuvneshwar Kumar to bolster their bowling attack for the remainder of the series. It would have been a result, had it been a loss, that would have called into question the decision of the Indian captain to experiment, with the series not yet decided, by choosing to bat first given the history of the ground (the team chasing had previously won five of seven). Therefore, it was a tie which felt like a defeat for the Caribbean men and a win for the Asian team. Jason Holder seemed a man who’d done extensive homework as the Windies captain was meticulously spot-on in his field placements for the Indian batsmen; homework which would have earned his team ten wickets on a different pitch on another day. For now, however, question marks still linger over his team’s inability to pick up wickets in the middle overs. This then provokes us to revisit the current phenomenon that is Devendra Bishoo. The thirty-two-year-old made his debut during the ICC Cricket World Cup in 2011 and has gone on to represent Windies in thirty-three ODIs. There is also the small feat of his 110 Test wickets. Therefore, experience must have taught the Guyanese the he poses no threat unless he flights the ball. A lack of threat that has over-showed the fact that he is the more attacking of Windies’ current spin options. While questions can be posed to the coaching staff about the leg-spinner’s lack of inclination to flight the ball, surely the onus is on him. In the meantime, Windies’ aim of swiftly settling their bowling attacking before the ICC Cricket World Cup 2019 has hit another talented bump in the road, having introduced yet another gifted seamer to international cricket in Obed McCoy following the introduction of Oshane Thomas in the first ODI. McCoy’s guile and variations were of high quality and he was duly rewarded with the wicket of the ‘Finisher’–MS Dhoni. Having mentioned Dhoni’s finishing abilities, there is a vacant ‘finishing’ position in this current Windies team, even more so in the absence of Andre Russell. It is time Windies gave serious thought to the possibility of Jason Holder batting ahead of Rovman Powell, giving Powell the opportunity to fill this void. Twice already in the series, West Indies has failed to capitalize on a dominant batting position with the arrival of either of these batsmen to the crease. There is no doubt Powell is capable of batting and batting long and in time he will fulfil this potential, but with a mere eleven ODIs remaining before the World Cup, maybe, just maybe, Holder should be the one looking to bat longer. As there will be time, proceeding the 2019 tournament, for Powell to deliver. 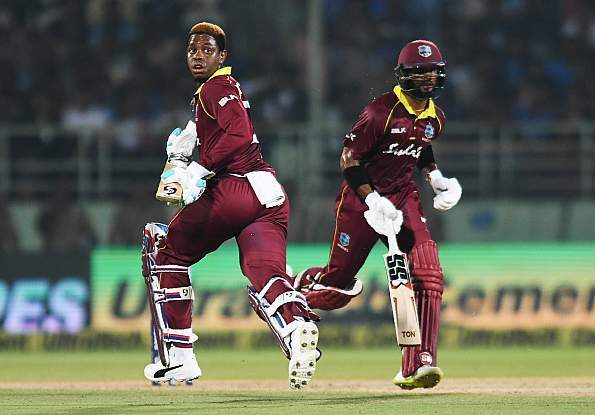 In addition, in the fourth wicket stand of 143 between himself and Hetmyer, roles were seemingly defined and Hope, unlike the first ODI, executed his quintessentially, by playing the anchor to Hetmyer’s battleship. It was disappointing in the final stages, however, that Hope did not practice what Windies players so often preach—backing himself. Instead, he gave charge to the new batsman, Ashley Nurse. That being said, here’s to many more positives in Pune on Saturday morning, in the 3rd ODI, so many positives that Windies win.